Typically, a president's choice for budget director barely gets noticed. Not this time. President-elect Donald Trump has nominated conservative Republican Congressman Mick Mulvaney to be his budget director. Mulvaney has made it very clear he thinks America's $19 trillion debt is too high and needs to come down. Budget hawks are thrilled. "He's not going to back down," says Maya MacGuineas, president of the Committee for a Responsible Federal Budget. "That is the advocate we need at this point because debt is so high as a share of economy." There's just one problem: Mulvaney's record on spending and deficits is out of sync with a lot of Trump's plans. Trump campaigned on an economic plan to cut taxes for businesses and individuals, make no changes to Social Security, and spend up to $1 trillion on infrastructure. 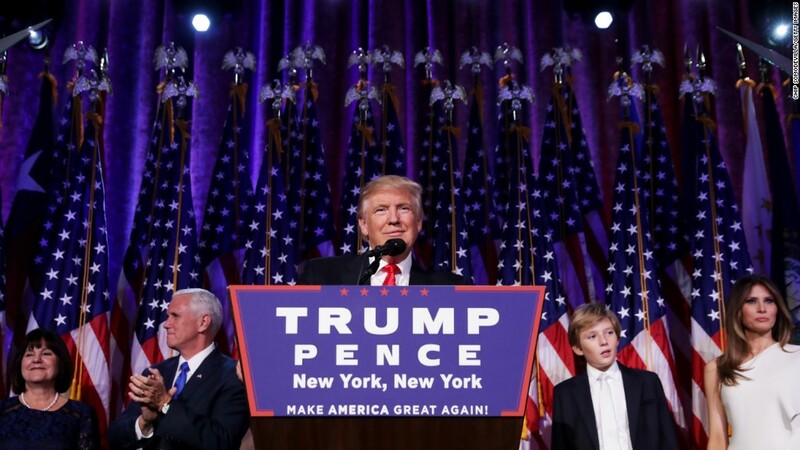 The Committee for a Responsible Federal Budget warned that Trump's campaign proposals would add more than $5 trillion to the debt in the next decade. "No one in Washington can quite figure out the appointment of deficit hawk Mick Mulvaney to head OMB," says Greg Valliere, chief global strategist at Horizon Investments. "I don't know how he's going to work." Now Mulvaney will be in charge of preparing Trump's budget proposals to Congress. 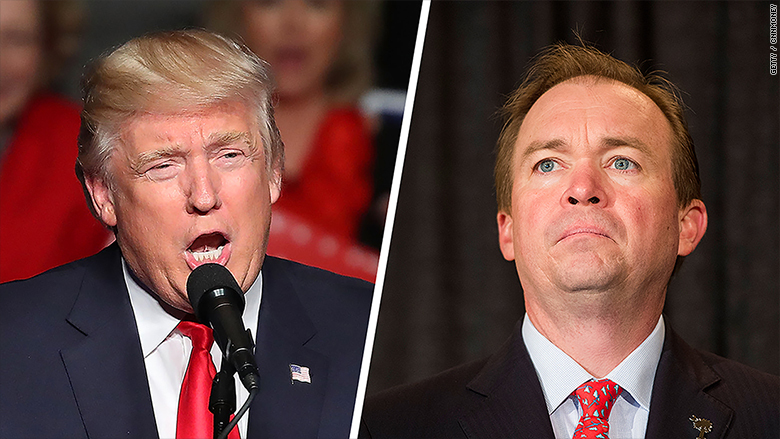 President-elect Donald Trump, left, has nominated South Carolina Congressman Mick Mulvaney to be his White House budget director. 1. Trump wants to spend. Mulvaney doesn't: The stock market has shot up since Trump was elected president. Some of that rally is because investors believe Trump will spend more money, especially on infrastructure. But Mulvaney has been against infrastructure spending in the past, especially if it's not clearly paid for. "Trump is a big spending Keynesian in some respects. How does a big spending Keynesian coexist with Mulvaney?" wonders Valliere. 2. Mulvaney doesn't like 'magical thinking': The Trump team argues that it is fiscally conservative because Trump will be able to grow the economy enough to pay for many of his tax cuts and other plans. Most economists call this "magical thinking." They are skeptical Trump (or anyone else) can get the economy going much more than 2% to 2.5% -- far lower than the 4% Trump has promised. In the past, Mulvaney railed against "gimmicks" that politicians use to try to argue their policies are paid for, notes MacGuineas. 3. Another debt ceiling debate is headed this way: President Trump will almost certainly have to appeal to Congress in March for more room under the debt ceiling to keep borrowing and pay all the debts the U.S. has already promised. In the past, Mulvaney has voted "no" against raising the debt ceiling. He voted "no" in 2011 when the stalling in Congress spooked the bond market and ended up costing the government more money by raising borrowing costs. It could be a major sticking point in 2017. Markets get very jittery when Congress does not act to lift the ceiling. It could even trigger a default. Experts say the easiest compromise may be for Mulvaney to push to raise the ceiling in March, but only if there's a plan passed as well to control spending. House Speaker Paul Ryan's office praised Mulvaney as the "right choice" for budget director, even though Mulvaney is co-founder of the Freedom Caucus, which has been vocal in its opposition to the GOP establishment. The Freedom Caucus was a major force behind ousting former Republican House Speaker John Boehner from power. Trump's spokesman Jason Miller told reporters Monday that Mulvaney is a "loud voice" for curbing "out of control spending." People who have worked with Mulvaney before say he is a dealmaker, much like Trump. But it remains to be seen how far he'll go on his core principles. "There are a whole lot of policy promises [the Trump team] hasn't talked about how to pay for," says MacGuineas.